California-based airline, Virgin America, is looking to beef up its sports content in time for the football season. 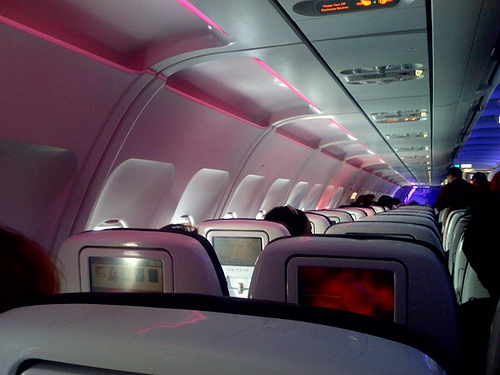 So it's adding more network channels to its in-flight entertainment system. Virgin has a "Red system" which is an in-flight entertainment system that now has more content with live sports and news for it's guests. To the system they just added 4 new stations, NBC-NY/WNBC, FOX News, TBS and FOX-NY/WNYW, all channels that are live TV. The Red system also provides more than 35 on-demand films, 3,000 audio files and video games. Sweet! All of the new channels mean one thing, more NFL football for people! Since the stations are LIVE you can catch your favorite team playing now. Double sweet! this is great i can watch my favorite nfl games during my flight.